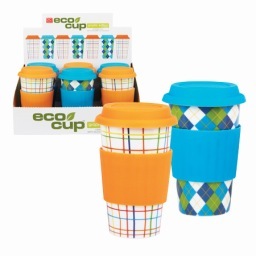 Cool hues of blues and green in a trendy argyle pattern or colorful thin lines, these cups have got a bit of flair and style all their own. Bright orange or blue silicone bands keep your hands cool when the cup contains a hot beverage. Cup holds approximately 16 fl. oz. Microwave & Dishwasher safe.